I have to say I am really starting to love Pinterest! I think this site will climb higher in future years and even in some circumstances, it could possibly serve applications when people are doing online searches better than Google... wow, I said that. Screenshots ... on Apple products, phone, ipads, Imacs... wow... easy to snap then modify on your computer in "preview". On Mac hold "shift" then "command" then the number 3 for entire screen or the number 4 to capture a specific part of the screen. Preview editing - Open your jpegs or png files and go to tools and review options and edit to your heart's content:)... Lol ... seriously you can do a lot of image editing and banner creations for free on your Mac! Flickr ... free online photostorage, 2 terrabytes!! Amazing, wow :-) You need a Yahoo account - easy. Evernote - great free app for storage, works on Mac and all Apple gear and PC's, Android... one account to connect everything! Desktop, tablet and mobility. On their servers, ... monthly upload limits on free account. Pro level upgrade for a small fee, $5 a month or $45 per year. Store files forever and access them anywhere, really? Yes really!!!... Here is a referral link. If You sign on through my link ... we both get a month of PRO level extra's for FREE :-) a $5 value... hey, that's moolah: GET EVERNOTE. ﻿Jotform﻿ - Contact Forms and link options - try JotForm.com. Over 4,000 forms available! Weebly, Wix and WordPress - all great site building options. I love Weebly best, won PC magazine editors choice award 2014. Freshbooks - create and send online invoices, free introduction then monthly fees reasonable. Google Sites - are not all that difficult to build after some practice, but I find creative limitations. 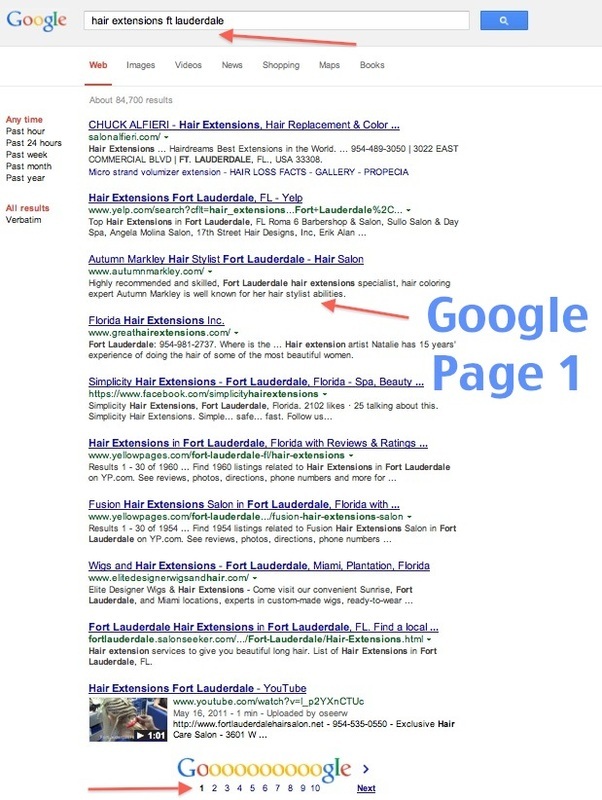 Here is an example of a Google site I built, Fort Lauderdale Seo for websites. Generating incoming links from Google helps your search engine optimization and your website positions for online searches. Also Google sites are free which is very cool, even though they're not the easiest platform. I prefer to use Google sites as a secondary site. Google Plus - I recently made a personal Google Plus page on Google, and created business ones. I've been a professional guitar player and working musician all my life and web designs and search engine optimization have become other passions. Love learning... Google business pages are important for LOCAL business. Facebook Business Page - you know why. Yeah I have one for my band, and now one for my art and web design... FB is good for promotion to some degree, especially if you have expensive products, need worldwide exposure, etc... but I don't waste dollars promoting on facebook, "boost" posts that people in India will hit like because they are paid to do it, etc. Lots of reasons why, look it up on Google. BTW - more than one person can be an administrator for your Facebook business page... cool eh? Embed videos right into your website from Youtube! Youtube is awesome. It's owned by Google and it's great for Seo too, although optimizing it is important and time consuming and old Youtube channels need to be updated. It is the second leading search engine/ site and it's worth all the effort if you link your sites and optimize your videos well. One crazy thing about youtube is that you can't move your videos from one channel to another. You have to upload and start from scratch again... you can "like" the videos on your other channel, you can add them to a "playlist" on your new channel, but they are not yours. I'm a musician too... performing in cover bands for years... if you wanna peek, here is the YOUTUBE "playlist" I created of videos I performed in from my other youtube channels. Robyn Fear band music videos on Youtube. I'm the blonde chick guitar player :-) playing with my dance band Sunsetbayband, and in the video above on acoustic guitar with the Voice semifinalist, season one, songwriter Beverly McClellan. I also made a channel of useful tech videos I found on Youtube about site design, optimization, facebook, etc. Perhaps this channel may be useful to some of you. I started it recently. Anybody wants to hit like buttons, thanks! Honestly SEO is so hard to do... it's not building a simple site and magically yours beats the hundreds or thousands built before yours. Building a simple site is kinda easy today, but building your campaign, optimizing your site and getting it on page one on Google so new customers will find you... that is the key. Finding a designer who can do this is also not always easy. Those of us who can do it, will show you proof. See screenshots of some of my successful web client's sites that I achieved top positions on Google for their keywords bringing them business. 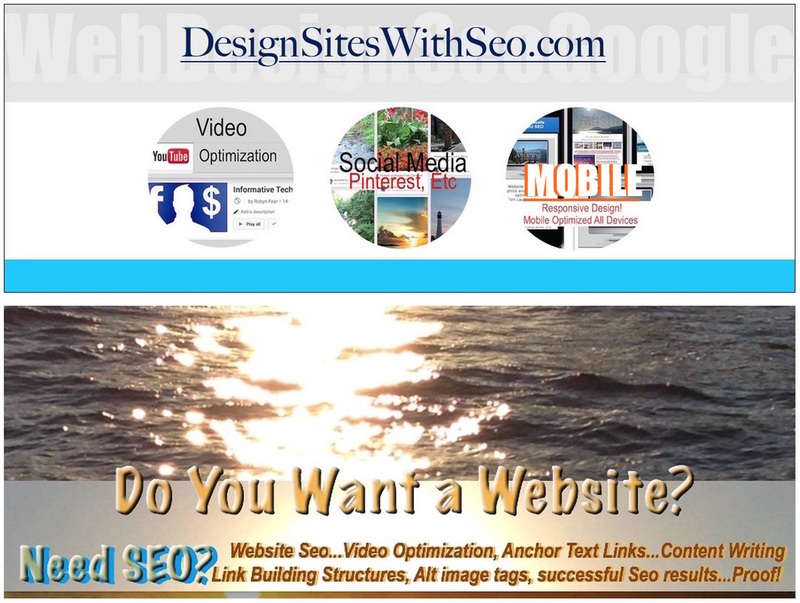 I use tools above to assist me in various ways for web design, and for top seo positions for websites I build. 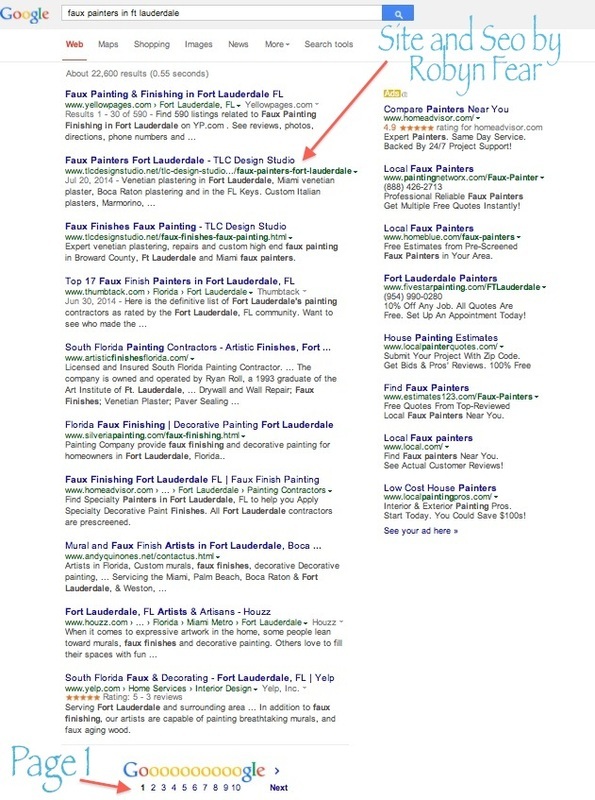 Top seo search results for TLC Design Studio website by Robyn Fear, Fort Lauderdale web designer.